Like Ola Englund – who we talked to before – Keith Merrow doesn’t really need an introduction. So instead of writing about his endeavors of filming perfect Playthroughs and Gear Demos we’ll cut to the chase and immediately start with the interview, alright? Hi Keith! First of all – thanks for the interview. What have you been up to lately? Thank YOU for the interview! 😉 I’m currently juggling multiple projects. Aside from writing a lot of music this year, I’m keeping very busy with my job at Seymour Duncan. I do artist relations and media full time for them. So, I’m working with a bunch of different artists and creating a lot of audio and video content. Fun stuff! We recently reviewed your Schecter signature guitar, the KM-7, and loved it. You have probably answered this question lots of times before but could you tell us a few things about it? 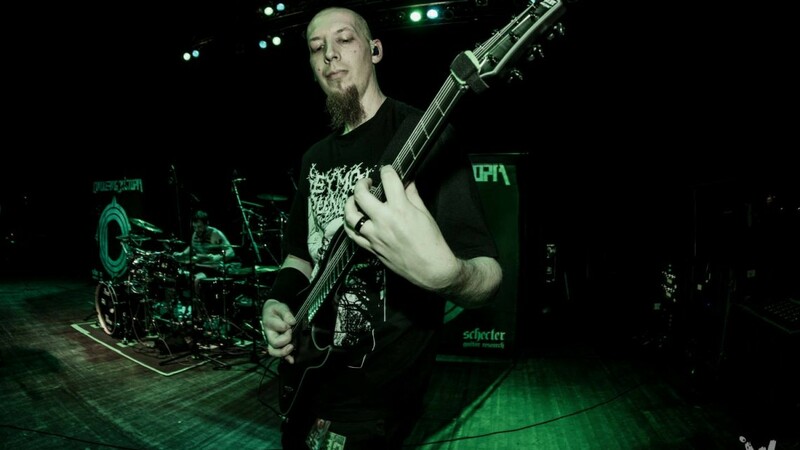 What was your and the Schecter guys’ main focus when designing the guitar? Glad to hear that you loved it! I saw the review and I thank you for the great input on it. 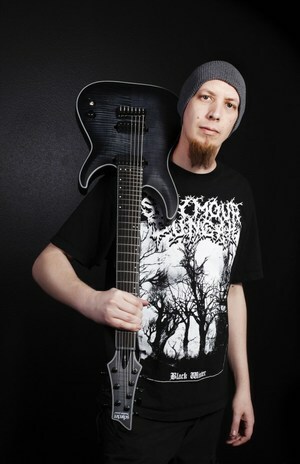 When I started working with Schecter on the KM7 guitar, I already knew what I wanted. I had the specs set aside for my ideal guitar, which I was probably going to have built at some point. So I went into it with specs I would have requested on a custom shop guitar. After a couple prototypes, they nailed it for me. I think it’s really cool that they were able to make a guitar with such amazing specs, and offer it at a price that most people could afford. The goal for me was to have the ideal guitar for the type of music I like to play, with the tone that I love. That’s not “endorsement speak”, either. I really do prefer the KM7 over just about anything because it’s exactly what I want in a guitar. Plus, when I wear it out, I can get another exactly like it. The quality is very consistent on them. Some people might have missed it: You’ve been working for Seymour Duncan for a few years now. Did they approach you after discovering you on YouTube? I met the Seymour Duncan staff for the first time at their VIP party during NAMM a few years ago. My friend Ola Englund and I were invited to the party, and we started talking about YouTube and social media. They said they wanted to start having me do some demos for them. After NAMM, they sent a bunch of products and I whipped up some shootout videos. They liked those videos enough to create a job for me. I was Duncan’s first “remote” employee. 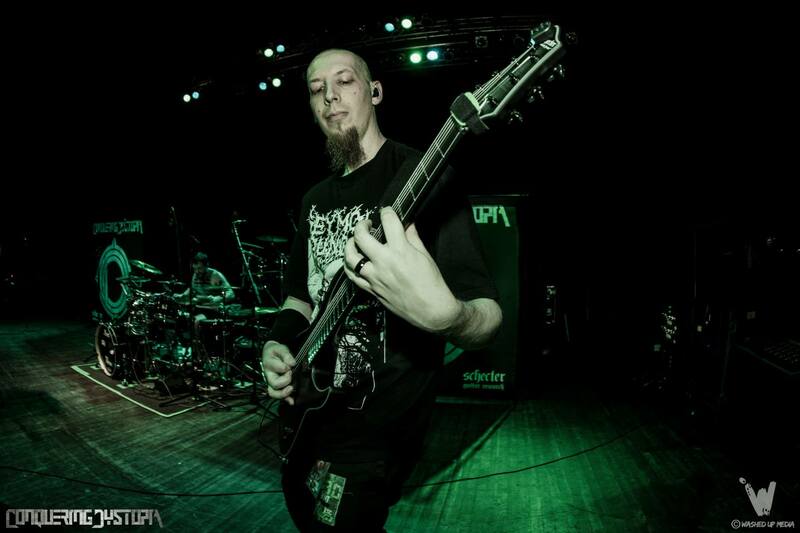 I started out doing tech support over the phone and email, but now I produce audio and video, as well as provide artist relations for the Metal players. In addition, I help design new products, such as pickups and pedals. I’ve had the pleasure of helping some great artists design signature pickups, which is a lot of fun. I work out of my studio in Portland, Oregon. It’s a dream gig, and I truly love the Duncan crew. Such a great company to work with! Which brings us to a question we have already asked Ola Englund: I often see people asking how to pursue possible endorsement deals on the basis of a YouTube channel with a few playthroughs and a couple of followers, rather than being in a band and playing lots of shows. Do you think the perception of how to become a successful musician and especially guitarist has changed because of your and others’ success as YouTubers? Hard to say for sure. I have several close friends and colleagues who have told me on several occasions that the type of videos guys like Ola and I have done changed the way products are demoed and marketed in the MI. Even just a few years ago, it was pretty unheard of for a YouTube guy to be taken seriously enough for companies to consider them worthy of endorsement. But, a lot of companies have caught on, and YouTube is essential these days. Some YouTube guys have obtained many endorsements from music and demo videos, so it’s totally possible to do. I got my first guitar endorsement by doing videos around late 2007 if I recall correctly. It was offered to me. I hadn’t even considered that it would be possible to get an endorsement from playing guitar in a YouTube video. I think I just got lucky. I didn’t have a whole ton of subs, which is really what they look for now. A major company once reported to me that a video which gets 30k views in the first couple days is a way more effective sales tool for them than a band that tours full time. So, things are definitely different these days, and companies will endorse a guy who has a large subscriber base and produces cool content. I get quite a few emails each week from people wanting to break into doing similar types of videos and start working with companies, and most commonly, endorsement. The thing is, it takes a bit more than just being a rad player with a camera and a few subscribers. Endorsements will happen organically once you’ve accrued a lot of subscribers and release great content on a regular basis. I think most people understand that endorsements are supposed to be mutually beneficial for the artist and the company. Although, you’d be surprised by how many people think they’re eligible for endorsement just because they’re good at guitar (or whatever instrument). You have to be able to promote products to the company’s target audience, and have a pretty deep reach in the guitar community in order for it to be a benefit to that company. I usually suggest that people demo the gear the currently have, borrow gear from friends, invest the time it takes to make a cool demo that sounds great. If it’s good, it will get noticed, spread around, and you will gain a lot of subscribers. Once you have a healthy amount of subscribers, you have the target audience that those companies look for. Without that, endorsement is a bit unrealistic. Never be afraid to upload music or videos to the internet. Just make sure you can look at it and say “this is the best I can do”. You never know what might happen! It all starts with music, though. I think being a decent musician is the key ingredient in all of this. ALWAYS care way more about your music and playing than you do about gear or endorsements. I started out by just posting playthrough videos of my music. It morphed into gear demos when companies started asking me to use their products in videos. Don’t ever let gear be your primary focus or motivation for wanting to go down the YouTube path. That’s shot. Be a musician first and foremost. Spend more time practicing guitar than you do talking about gear, watching videos about it, or even creating videos about it on YouTube. Use your free time to write music. So when you make your own videos, you’ll see people say they just watch your gear demos because of your music, and then you’ll know you’re doing it right. The music you play through that gear will hopefully keep people coming back to your channel. I’ve seen great players do poor gear demos, and ametuer guitar players do great ones. Whatever category you fall in, just always do your best. Don’t even upload it if you think you can still do it better. You recently had the chance to design the Alpha/Omega-Set together with Mark Holcomb of Periphery. Could you give us a few nerdy insights on the whole process of designing and refining a guitar-pickup? Mark approached me about designing some pickups when he was developing his signature guitar with PRS. Mark and I have been friends for quite a while, so I was already familiar with the types of tones he needs for his music. He’s been a fan of Duncan pickups for a long time, and felt that we’d be able to create a perfect set of pickups for his style. So, we met up at the Duncan headquarters in Santa Barbara, California to dive into the project. Him and I worked directly with Kevin Beller, the lead engineer at Duncan that has been there for about 30 years. He’d build a set based on the tones and character we described, and then we’d test them in Mark’s guitar, using his AxeFx rig. We went back and forth a bunch of times, fine tuning the pickup and trying different iterations. Towards the end, it was like splitting hairs. All the prototypes were awesome, but the final versionsa that Mark decided on are really special. They have some serious mojo to them and sound crazy good. The neck pickup is a vintage output wind with a ceramic magnet. It’s different than any other Duncan neck pickup. They have a couple ceramic neck pickups, but they sound nothing like the Alpha. It’s not quite as bassy as most neck pickups, and because of that, it has insane clarity and sparkle. It responds to pick attack very quickly, and sounds amazing for both clean and high gain tones. The Omega bridge pickup is on the upper end of a moderate output pickup. It’s also ceramic-based, and pairs very nicely with the neck. It’s hot enough that you get a lush saturation, but maintains clarity when playing big chords, even if you’re running a lot of gain. The notes just bloom in a very musical way. It also has one of the most aggressive sounding palm mutes I’ve ever heard. The thing is capable of sounding real pissed, haha. I have been rocking them in a couple guitars and they also fit my sound very well. They’re pretty versatile. 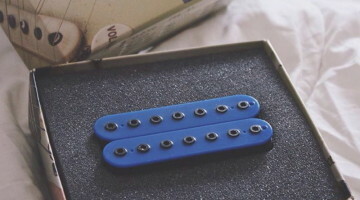 The whole process of creating these pickups took about 4 days, and it was extremely fun. The demo video you posted on your Youtube channel sounds incredible. Will there be 7- or even 8-string-variations available of the Alpha/Omega-set? They’re being released as a limited edition set through the Duncan Custom Shop in 6 string. However, the CS can build just about anything you can dream up. So, they are definitely capable of making them in 7 or 8 string. I have a prototype set of 7 string Alpha/Omega pickups in one of my KM7 guitars right now. Sounds unreal. Let’s talk about Conquering Dystopia. Can you tell us a bit about the process of writing- and recording the album? The project initially started out just being a side thing that Jeff (Loomis) and I wanted to do together. We’ve been buds for a while. It kinda just happened organically. It was like “yeah, let’s do this!”. By the time we started writing music, we had already talked to Alex Webster (bass) and Alex Rudinger (drums) about it. We were all really excited to work on it. Jeff would take the train to my house every weekend and we just wrote the album. We’d send the song arrangements to the other guys, and they’d write their parts to accompany what Jeff and I had going. We ended up having a very thorough preproduction of the entire album. So, we pretty much had it all mapped out before we even started the final recordings. Every note was gone over by all of us, and we didn’t deviate much from what we worked out in preproduction. We did an Indigogo crowd funding campaign to help get this off the ground. Thanks to all the awesome supporters, it was a huge success, and we were able to have the drums tracked and the album mix/mastered by Mark Lewis at Audiohammer in Florida. I tracked all the guitars at my studio, and Alex Webster tracked bass at his house. What’s your plan for Conquering Dystopia in 2015 and do you have other musical projects in the works? The biggest order of business with Conquering Dystopia is to continue and finish all the backend work from the crowdfunding campaign. We had never done a campaign, and didn’t expect it to blow up the way it did. We’re very fortunate for that, but as you can imagine, it created a lot of obligations for us to fulfil to our fans. We’re talking about doing another album, but we just really want to make sure we get everybody what we promised them before diving into another record. Thank you very much for the interview, Keith!